WASHINGTON—The Trump administration’s tax reform blueprint was welcome news for women entrepreneurs who bear a substantial tax burden on their profits. Women-owned businesses represent more than a third of all U.S. companies, and the vast majority of them are pass-through entities that are subject to the individual income tax. 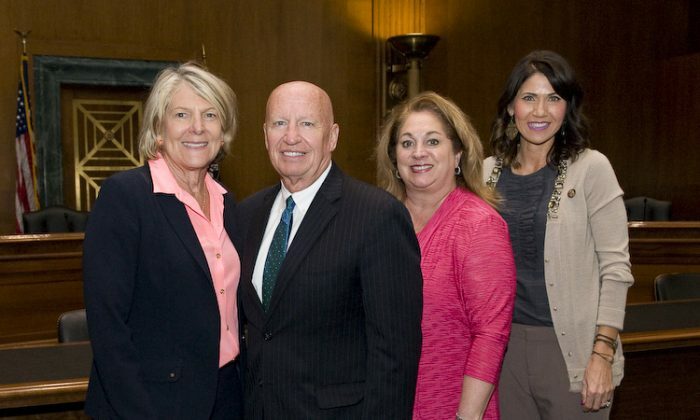 “We have seen an incredible step forward in trying to equalize the tax burden for pass-through entities and C corporations,” said Jane Campbell, president of Women Impacting Public Policy (WIPP), a nonpartisan organization advocating on behalf of women entrepreneurs. The tax overhaul plan proposed by the Trump administration would reduce the tax rate to 20 percent for regular corporations (also known as C corporations) and to 25 percent for pass-through businesses. “Our members are really encouraged,” Campbell said at a congressional luncheon hosted by WIPP on Oct. 4. According to her, this new tax rate of 25 percent would give a boost to the country’s 10 million women business owners. Proposed tax cuts will allow business owners to keep more money in their pockets. According to Campbell, women entrepreneurs are willing to spend that money on strong retirement programs for their employees, capital investments, research and development, and hiring. “They’re so excited at the idea that they can reinvest in their business and allow it to grow,” she said. Women-owned businesses have more than doubled in number since the last major tax overhaul under President Ronald Reagan in 1986, and today 90 percent of them are small businesses, according to WIPP. Many women-owned businesses are, like many small businesses in the United States, structured as pass-through entities. Their earnings pass through the business owners’ tax returns, and are taxed under the individual income tax. Pass-through businesses include sole proprietorships, partnerships, and S corporations and are subject to an individual rate of 39.6 percent under the existing tax code. The tax burden can go up as high as 43.4 percent at the federal level. “For the first time in history, we are proposing the lowest rate for corporations and the lowest rate since the 1930s for our small businesses,” said House Ways and Means Committee chairman Kevin Brady at the WIPP luncheon. Critics of the tax reform plan argue that the proposed rate cuts benefit large corporations more than small firms as the plan proposes different tax rates for regular corporations and pass-throughs. According to Brady, the difference in tax rates is mainly driven by the variances in tax structures. Tax reform aims to create an equal tax cut for every business regardless of their location, structure, and size, he said. Small businesses will benefit from many of the provisions of the tax reform plan including lowered income tax rates and the elimination of the estate tax, according to Brady. The estate tax, or the so-called death tax, is a tax on the transfer of the estate of a deceased person. “This [death tax] is the number one reason our family-owned farms and businesses aren’t passed on to [the] next generation,” he said. South Dakota Congresswoman Kristi Noem called the death tax an unfair tax. “To tax a family at the time of death is the most terrible thing this country could do,” she said at the WIPP luncheon. According to Noem, 70 percent of family businesses do not survive to the second generation, and 90 percent of family businesses do not make it to the third generation. Most Americans end up selling their family businesses or farms to be able to pay the death tax, she said. Opponents say that the impact of the estate tax on family operations, especially with an exemption of nearly $11 million per couple, has been overstated and the repeal will favor the wealthy few. Nearly 2 out of every 1,000 estates face this tax, according to the Center on Budget and Policy Priorities. However, the death tax hits all businesses including the small ones, according to Noem. “If we had a gas station or grocery store, the only way we could have paid those taxes would be to sell the business and lose the family operation,” she said. “So don’t buy into the story if you hear that this [the repeal] is only benefiting wealthy individuals,” Noem said. According to a study conducted by American University’s Kogod Tax Policy Center, the majority of women entrepreneurs cannot fully benefit from the existing tax code’s provisions because of how they’re legally organized or the industries they’re in. The Trump administration’s tax reform plan is a good start to helping women-owned businesses succeed, according to Campbell.